Germans don't do Thanksgiving and Halloween. Neither do the South Africans, to whom I am married. We currently live in Dubai, in a Muslim country, who, least of all have any relation to any of these events. There is an expat community out here amongst which Halloween seems popular. However, my 4-year-old son hates dressing up in costumes. So even from his side no real interest in all this. Nevertheless, the least I can do is using some nice seasonal autumn vegetables and fruit in my cooking and baking. 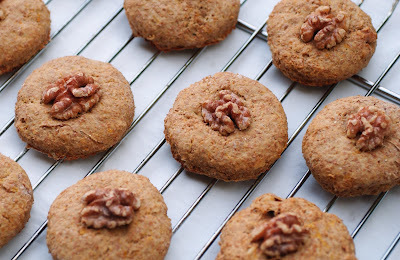 These pumpkin cookies are just perfect for breakfast as well as for a snack between meals. Not too sweet, and still not savory, yet seasoned with cinnamon and ginger spicy enough to give it a round delicious taste. The walnut pieces inside the biscuit add a little crunchiness to the otherwise chewy biscuit. Cut pumpkin into bite size pieces and steam until tender. Let cool, then mash. In a large bowl, combine the flour, baking powder, salt, cinnamon, and ginger. Cut the butter into little pieces and add to the flour mixture. Using your fingertips, work the butter into the flour mixture until it gets a slightly crumbly texture. Then stir in the chopped walnuts. In a smaller bowl, whisk together the milk, mashed pumpkin, agave syrup and honey. Add wet ingredients to flour-butter mixture. Stir briskly until well combined. Let stand for a few minutes. Flour your hands and your work surface. Gently knead the dough into a ball, then pat it into a 1-inch-thick disk. ut the dough into circles (using a cookie cutter or small drinking glass) and place them on the cookie sheet, leaving a couple of inches between them. Repeat this process until you've used all the dough. Put one walnut half on each cookie, pressing it a little into the dough. Bake the cookies for about 20 minutes on center oven rack or until light golden brown. Transfer them to a wire rack to cool for 5 minutes before serving.